Having large, open rooms is the ideal look for any home, but you may not have many open spaces in your home. Not to fear—there are a number of ways that you can transform a small room to look larger and more open without having to completely renovate your home to create those spaces. Larger flooring materials can easily make a room feel bigger. Fewer seams between planks and tiles create an open pattern that looks less confining and busy. Choose wide wood boards that are three inches or more and lay them parallel to the longest wall in the room, as laying boards this way can help elongate a room. Tiles measuring between 12 and 24 inches are ideal for making a room bigger, and use grouting that is the same color or close to the tile color to increase the visual look of the floor. 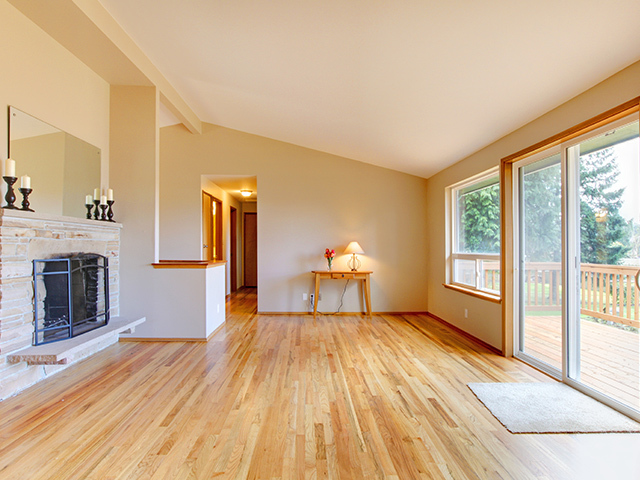 Laying your floors diagonally is one of the most effective ways to create a larger space. Diagonally laying floors tricks the eye into seeing the pattern in a different perspective, which also creates more visual interest. Laying ceramic tiles in a diamond pattern as opposed to a standard checkerboard pattern prevents the space from being measured in tiles used. However, a room with frequently interrupted wall spaces is not ideal for diagonally laying floor, especially if large tiles and wide planks are used, as the space imposes limitations on the material. While most interior designers will swear that using lighter colors will make the room look bigger, dark wood floors can easily make the room look bigger. Using a cool paint color for the walls can help match the effect with dark wood floors, and crown molding in a lighter shade can help the illusion. Installing a floor with a consistent material and color can tie together a home with an open floor plan, creating the illusion of one large room. Perfect Flooring is your number one source for all of your flooring needs. Our quality products are at competitive, discounted prices and our fast and convenient installation provides you with a beautiful floor at an affordable price. Call us at 412-927-1011 for more details or to get a free quote and start redesigning your floor today!